You are here: Home / Documents and Views of Early Vassar / Mary Augusta Jordan: "Spacious Days at Vassar College"
Mary Augusta Jordan: "Spacious Days at Vassar College"
Mary Augusta Jordan (1855-1942) graduated from Vassar in 1876, the first of three Jordan sisters to attend the college. She received her Master's degree in English from Vassar in 1878 and served as a "critic" in the Vassar English department from 1880 to 1884, when she accepted an appointment as an assistant professor in rhetoric and Anglo-Saxon at Smith College. Jordan taught at Smith until her retirement in 1921, becoming a much revered and beloved member of the Smith community. In 1910, Smith awarded her an honorary doctorate in humane letters, and in 1921 she was honored by Syracuse University with a doctorate in pedagogy. In 1915, as part of Vassar's celebration of its first 50 years, Mary Augusta Jordan delivered this vivid and insightful recollection of the college of the 1870s, entitled "Spacious Days at Vassar College." 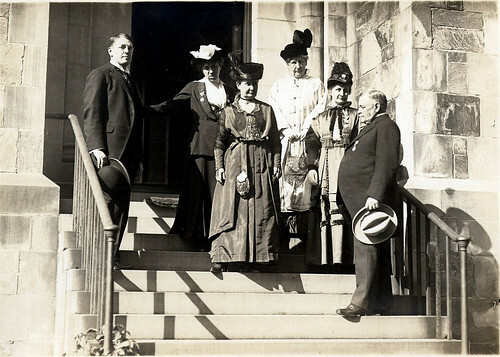 At Vassar's 50th Anniversary: Mary Augusta Jordan (center) with (left to right) President MacCracken, Julia Lathrop '80, Ellen Semple '82, Louise Meigs '91, and President Taylor. IT is logically hazardous to attach a term of general import to a limited period of time. Yet the making of mere record into useful history requires it. Without it, local significance would be baseless. Village Catos and their little senates, the mute inglorious Miltons, the great kings before Agamemnon, the floods since the one of controversial Noah, the human torpedoes before Bernard Shaw, the spacious times of great Elizabeth, with attention to the agate on the finger of an alderman, before the Japanese revelation of infinite riches in a little room of adjustable paper sides, and a single centre of interest in a fortnight's worth of flower arrangement in one priceless porcelain, encourage the analysis of the fifty years of Vassar history into periods of discriminated character. Spaciousness, with its exclusions and its stimulus, its dangers of emptiness and of vagueness, is the characteristic of Vassar from 1870 to 1880. After 1880, the years fell into the background of a crowded series. For Vassar College was founded not only as an expression of social justice, but as an installment of the ever recurring criticism of education, taking definite form in the favoring conditions of time and place. It required a generation of college administration to transform the passionate triumph of women securing a long-contested privilege into a serene acceptance of spiritual discipline. There were noble and ardent students in the earliest days of Vassar who urged their claim to its diploma as a seal of their equality with those who were conventionally rated as competent. There were others who viewed the process of the new education as an entertaining, if expensive, lull before the serious business of life; and a course of study had to be made which would readjust some of these misconceived ambitions, and would put before the ordinary woman the assurance of serenity in an every-day life. The novelty of the details of the entertainment added greatly to its appeal and contributed to a highly specialized type of excitement. Going to college was a thing quite by itself, an experience to be reckoned with —something like Platonic love, or getting religion. These factors, important or negligible as they may now appear, did not make for either clearness or simplicity in the conditions facing the men and women who were shaping the college policy. The student of Vassar history finds in those plans of Dr. Jewett that have never been embodied in any actual course of study offered to the undergraduates, some striking anticipations of the most advanced reforms advocated by the critics of the colleges of to-day. But, obviously, the first duty of the pioneer institution was to live and to grow, and at the same time to give temporary satisfaction to the irrational and immature critics who made up its public. It was, therefore, hardly before the seventies that this experiment could be tried. The result was compromise, natural, inevitable in itself, but not natural or inevitable in its results. The nervous tension of the earliest Vassar was undoubtedly too high. Its extremes of consecration and irresponsibility were both abnormal. By 1870 the wise compromise had done its costly work. Vassar did not stand, even in the funny papers, any longer for prigs, freaks, social rebels, or eloquent and earnest fanatics. What did it stand for? Freedom from any obligation upon the students to concern themselves with that question was one of the factors of the spaciousness that prevailed for ten years. The influences which led a young woman to prolong her schooling, her study, or her psychical elaboration were many and interesting at just this time. It is hardly possible to understand now, nor would it have been easy to exaggerate then, the significance of her position as a child of the generation after the Civil War. The close of the great conflict had [made] possible the opening of vistas of alluring activity, stretching out before the expectation of young creatures unquestioning in their faith that time's "whiter series" began when the considerate judgment of mankind and the gracious favor of Almighty God could be seriously depended upon as co-operating forces. There is no doubt that the typical student of this period came to Vassar equipped with certain inspiring and tonic faiths. She really believed that some things had been finally entered on the world's great balance sheet— the value of raw soul-stuff, for instance—and that in spiritual geography some boundaries had been established— as the one between vital and mechanical efficiency. Even in 1870 the declaration of the Franco-Prussian War and of the Infallibility of the Pope only stirred her imagination to a keener sense of gratitude for the providentially favored nation clause under which she was living. Such untoward happenings as a European war between civilized peoples were only echoes of the ancient error that delayed some men in their progress to full enlightenment. It is as hard to believe in the existence of such a young person now, as it was for her to believe in the existence of real obstacles to the acceptance by the world of the ideas she found so salutary. She was quite accustomed to call strife, ambition, greed, "illusions." Characters known, briefly, as "worldlings" were indeed admitted to be often awkwardly eminent and temporarily influential, but they were so clearly victims of desperate mistake that if they could not be reformed, they might be ignored. By similar rating, wealth and luxury were quite obviously accidents, of no real significance except in their abuse. As for family pride and worldly fame, she noted that the great individuals who had served the republic had converted the family name, with discouraging rapidity, into a monopoly, after the manner of the flesh, and into a world inheritance, after the fashion of the spirit. The Social Four Hundred had not then emerged from the dangerous classes, and Flora McFlimsey was thought to be an embodiment of a vice that needed only to be seen. The literary preferences of the time will illustrate this assurance of temper. When everybody believed without question that '"all service ranks alike with God," Robert Browning's poetry was lightly neglected for his wife's, and Mr. William Dean Howells's estimate of ''Hannah Binding Shoes" was quite generally anticipated. In her personal relations, too, this undergraduate was able to make extensive clearances. Temperament had not then been exploited as a charm or a virtue, but it had made a place for itself as a fascination. ''Elective Affinities, " "Counterparts," she dealt with as Adam did with the beasts in the Garden of Eden. She named these exotic, hot-bed, foreign. She paused a little ruefully over Miss Alcott's ''Moods," but looked at in the light of the principles of human brotherhood and of ultimate social equality, these preferential treatments were seen for the assertions of privilege they really were. No less than violence and brute force, these things warred against the spirit, while the immediate future held visions of the victories of peace with its ''strangely active arts and restless motions." Even the indeterminate present took on significance from the promise of the future and widened out into virtuous achievement by its good intentions. Then Henry James had not exchanged his published scrutiny of our national resources in character for his trans-Atlantic trade in shredded personality. Thus energy was released in all directions by the simple acceptance of faith in progress. It was to come in the form of physical, moral, and intellectual enlightenment rather than as the attainment of specific results or as the accumulation of material goods. It was easy to see hope for the whole groaning and travailing creation, when once the truth had been grasped that the care of the aged and of the young children was a luxurious by-product of exuberant life and not the burden it often seemed. So simple did this make human existence, that the average citizen could keep a diary without fear of discovering in himself a multiple or fractional personality, still less of making up a record for a mere occurrence or human blunder. Life and living being in themselves satisfactory activities, diversion and amusement had little independent value. They seemed to be expressions of some error or lack. Straws and rattles were for children, heavy or empty hours for the sick in body or in mind. The play-impulse was generally left to take care of itself, or transformed into creative imagination. The past and the distant did not seem better for being far, because the simplest and slowest of mortals was nevertheless moving among worlds unrealized where every step was adventurous. Just beyond every crossroads of decision or mile-stone of action, there seemed to lurk some new, infinitely valuable discovery which would change the old proportions and substitute new currencies. A young generation felt a strange call from the future and so turned a perfectly courteous back upon the past with its failures ; and with a resolute morning face fronted the new order of things where everybody should have a fair chance, where it should never be too late to make a fresh start, and where friendship should be the leading business of individuals and of nations. To this end, serious attention was given to the working up of humanity in the raw into the best possible product. Education was never before so generally a matter of course. But the process was not so well defined as the result desired was clear. At Vassar, for instance, the examiners were often confronted by candidates who had had no correspondence with the office, who had not read the catalogue carefully, and who were not in any definite way "prepared." They nevertheless were hard to convince that the desire for college advantages should not be gratified, or that certain attainments of theirs should not be temporarily accepted in place of the fixed requirements. There were curious instances of candidates who could not pass examinations who felt that their willingness to learn ought to count for something, and who viewed the examiner as a friend to be profited by and not as a difficulty incarnate to be overcome. The somewhat languid pace at which registration and other mechanical operations connected with entering college in those days went on was made not only tolerable but enjoyable by the vivid sense of social experience that accompanied it. In those days hardly anything was less like a factory than a college was, although even factories were not the standardized machines they now are. Variety in men and women was a mark of an interesting community. But symmetry did not prevail in the characters of the teachers, nor was logic aimed at in the conduct of the departments of instruction. Unexpected improvement in the student was everywhere preferred to orderly conduct of the intellectual process. And such sudden change was almost as much coveted by teachers and depended upon as was conversion in the old view of religious experience. It secured a wide range for effort and expectation. Almost as if in response to this attitude of their teachers, not unfairly comparable, perhaps, to a conference of powers where all were sovereign, but some great and others small, the students of that time had no inclination to legalize their relations within the college, nor was legality thought to be worth emphasis for its own sake. Whittier, Thoreau, Lowell, Robert E. Lee, and Abraham Lincoln had raised issues that had left one generation antiseptic to the legislation virus. So Vassar students went serenely forward meditating gainfully upon law, but stiffly resenting the multiplication of statutes in education or in social relations. Of course they were also free from the burdens and responsibilities involved in the student activities, for the most part, at that time, uncreated and undreamed of. What did these students do, then, with their energy and their time, so imperfectly and inadequately filled by college work? The answer is a simple one. They lived with the faculty and shared their wider outlook and brooded healthfully on things to come. The typical graduate of the seventies increased instead of depleting her central energy during the four college years. For this result, she owed much to the temper of the men and women who made up the college government. They presented, to the undergraduate eyes, something of the ideals of cultivated individuality described by Emerson as a circle of godlike men and women, embodying the social friendship resulting from the pursuit of lofty and shared aims. The conception of teachers as whetstones for the students' minds, or as high-grade coaches to put intellectual athletes on their way, or as cosmically remote forces in scholarship to be utilized for service by cautious insulation in measured volts, was not then at all generally accepted by students or by teachers. The teachers were still the best part of the college; they held their own fairly well with libraries, art collections, the countryside, and even student influence. The faculty virtues were thought to be epidemic. But the atmosphere had other factors of influence. The presence of the preparatories, as they were called— that is, students not yet of full college grade, sharing in the college equipment, and often being taught by the same teachers, sometimes in the same audience with the regularly classified collegians—was made to appear highly creditable, contributory to a desirable variety. It was really a contribution to the problem now engaging attention under the name of the essential unity of the educational process. The impression it made upon the college public was much simpler than this designation implies— it was really, with all the administrative and theoretical difficulties which ultimately occasioned its abolition, very vital, organic, and human. It effectually prevented one fault now alleged against the modern college, that the recipients of its training all wish to be doing the same things and thinking the same thoughts. The preparatories reversed the Greek formula and supplied difference in unity. Naturally there was a marked absence of rigidity in administrative order. Vassar illustrated easily the best aspects of what may be called academic quantivalence. Teaching Greek did not unfit an officer for usefulness in the library, and the instructor in gymnastics might teach German. The watertight compartment treatment of learning, or even of scholarship, would not have seemed dignified to the aspirant for culture in those days. So it was not surprising that small corner-rooms occupied by members of the clerical staff, or of the music department, or of the messenger system were centers of perfectly recognized culture and influence. Furthermore, the disappearance of a department from the catalogue list did not carry with it censure, or a verdict of its negligibility, any more than the failure of a comet to meet expectant watching argued its astronomic incompetence. The course of study was essentially a co-operative affair between each student and the faculty. It was, therefore, not half so shameful to fail of graduation with a particular class as it was to force the bestowal of the college diploma upon a "meager senior. " The lists in the catalogue of this general period read a little like Punch's description of the railroad trains in Bradshaw. Most of the work was conducted intensively. Completeness was looked upon as preposterous, not so much because of the shortness of the time at the disposal of the student, as because of the waste of time and energy that would inevitably result. There was a surprising amount of emulation between experts, but a surprising lack of competition between officers. Students were urged from one department into others, sometimes literally pushed out from an early, and, in the line of least resistance, favorite, in order to prevent the repetition of process technically familiar. Men were of the opinion of Mahbub Ali that when the pony is made — finished, mouthed, and paced (in a line of work), from then on, day by day, he will lose his manners if he is kept at his tricks. In the same connection, possibly, it had come about that the course of study was unabashedly regardless of outward show of logic, balance, and symmetry. It was really the beginning of the end of the spacious days when a literal-tempered young faculty person proclaimed as ground for needed reform the fact that the hours of the working day would not cover the demands of the time-table. To her in brief time was added one who urged that it was illogical to require work that did not count in definite hours and in the rewards and punishments of marks toward the earning of the Bachelor's degree. She held that bodily presence and promptness ought also to have definite recognition, that the student might know the exact total of her risks in absence and inaccuracy. But in the spacious, free, and already changing seventies students had been so long familiar with human paradox that they would probably have felt lonely without the factor of practical impossibility. As they come up for review, these things that did not count, and that were soon squeezed out of existence, and out of the memory of most, and out of the respectful consideration of all Hohenzollern-minded critics— what were they in detail? Lectures on painting and sculpture, music and physical training, public and private manners, personal economy and dress. There was practice in writing, public speaking, indoor gymnastics, outdoor exercise, chorus singing, private meditation, and Bible study. In all this, the material view of life was constantly opposed. Fortunately for this aim, interior decoration in the early part of this period was still where it had been left for one part of the country by Sherman's march to the sea, and for the rest by the war income tax. It was the Centennial Exposition in 1876 that began the holding up to the country of the international looking-glass and revealed our ugliness and left us with the problem of whether it was more than skin deep. Meantime the student life of the period moved freely among objects that in their barest poverty and utter nakedness marked the way to their spiritual opposites. Heavy tables were good to write on, William Morris and William Allen Butler agreed. Louis Quinze chairs and desks certainly would not have supported imagination. There were simplifications somewhat analogous to curtainless windows and red and green ingrain carpeted floors and disproportionately high walls, in the curriculum. Greek was not insisted upon, and history was allowed to take its place in connection with every subject taught. The hope seemed to be that the whole course of study would conspire to make students live Greek, and that they would then naturally avail themselves of the forms of self-expression the language and literature provided. The order of supply and demand described by Aristotle himself was more or less confidently trusted to in both instances— the ends that are beyond the activities are naturally superior to the activities. This was further exemplified by the variety of interests and relations which encompassed the classroom. Wealth and variety of physical life were endowed with dignity and almost religious urgency. There was nothing incongruous or undignified in the exposition of the Ferris waist or of union under-garments to the corporate college intelligence at after-chapel conferences. The same sort of personal responsibility was aroused by the president's presentation of the categorical imperative in the admired series of metaphysical sermons on Sunday mornings. The series was primarily addressed to the seniors, but the first-preparatory had a chance to hear it five times before it came her turn to listen with appropriating ears. The faculty afforded a varied commentary on the development of the ideas tentatively undertaken by the students. Exercise in the open air had definite rewards beyond physical recuperation when Dr. Hinkel and his dog Sailor were encountered. Walking became an effort at artistic imitation, fairly successful, when Dr. Alida Avery's searching scrutiny found nothing amiss in carriage or speed. From students to faculty, there was a steadily increasing and perhaps increasingly unconscious appeal. The academic exosmose and endosmose were quite perfect. Comparatively few students ever knew Miss Mitchell in the classroom, but scores knew her in the corridor, and few escaped her influence. Her infrequent illnesses were eclipses like those she taught the college to note, except that the college needed no teaching when she was obscured. She shed energy and intellectual exhilaration from her waving curls and following skirts. Her friends, who felt that they had sent her to Vassar at great cost to themselves and their various radical interests, came frequently to see how the big investment and its risks prospered. Whatever their attitude or their judgment on the main question, Miss Mitchell rarely failed to use them for the benefit of the undergraduates. She taught social bearing by the natural method at receptions, when no urging induced her guests to lecture or publicly express their interests or their warning and reproof for the hard hearts of a class of petted children, as they often took the students to be, despite Miss Mitchell's hopeful view of them. They were a sort of Theban band in their devotion to causes, but otherwise often unrelated. The halls were veritable highways along which they passed, and in which careless irresponsibility sobered into sudden quiet on meeting them. They were Miss Elizabeth[Mary F. ?] Eastman, Miss Anthony, Mrs. Julia Ward Howe, Lucy Stone, Louisa Alcott, Mrs. Livermore, Mrs. Stanton, and Emily Faithful, and they opened the whitewashed halls and rumbling fire-walls into long vistas of suggestion and of controversy. Quite different was the influence of Professor Farrar, who seemed the impersonation of abstraction. His lectures in freshman mathematics made the general subject live for the first time to many of his hearers. Thales and Pythagoras were shown to be likewise treaders of the toilsome way even as the men of the nineteenth century. The difference this made in the required work amounted to revolution. Perhaps no theme possessed less vitality than geology, perhaps none seemed more ornamental than botany, none less urgent than zoology; but Professor Orton changed all that for any student who talked with him for ten minutes. Such a one came probably on the Philistine errand of getting credit on her entrance card for some bits of study that she had brought from school. To her growing consternation, she was received as if she were a fellow scientist and a lover of the undiscovered, addressed as if she were in a position to compare past achievement with future effort. In the few minutes, she found her measure accurately taken, her self-estimate changed from something purely formal to something very real and like the Day of Judgment. For such a student, part of Vassar is in truth near Bull's Head in Dutchess County, New York, but part of it is a lonely, solitary, greatly honored grave on an island in Lake Titicaca. Similarly, any student who considered art a light occupation for the frivolous could never connect that impression with Professor Henry Van Ingen. He often described himself as no longer an artist, but a teacher of drawing and painting, a Dutchman and not a German. These distinctions became deeply significant when one knew that he preferred the limitations he acknowledged so frankly to the role of court painter to the Queen of Holland— a nice lady, as he genially admitted, but grimly after all, a queen. He spoke in the hearing of at least one young woman who had never dreamed that the feeling for kings and queens could take on any but verbal warmth. The borders of her world began to enlarge, and they are still widening out to meet the painful facts. There were, of course, many less striking examples of this expansion of the students' world by personal contact. Most of the teachers were remarkable for the many talents they kept at interest. There were very few who could do only one thing well, and many who lived a most enterprising intellectual life, to which they gladly admitted students and generously made them free of results painfully gained. No surprise was ever expressed at the tasks or attainments of the students. They also were citizens in the Republic of Letters. There was often an air of quiet expectancy of some interesting accomplishment from particular students on the part of the most sympathetic of the teachers. They followed with almost reportorial zeal the performance of seniors in the public presentation of the required thesis, as long as the custom lasted. The guests of the college in these years made students feel, each as if she were entertaining the lords of life, as they passed and repassed, intent upon their own purposes. George William Curtis imparted for the time being a fine envy of his elegant culture, but this did not prevent the students from courting the magic of John B. Gough. Mr. William Allen Butler, said to be the last of the New York lawyers who knew enough to be his own office-boy, and Dr. Benjamin [Benson] Lossing were among the trustees who helped students to think of corporations as having souls as well as purses. Dr. Magoon interested himself in providing art history and art collections and a proper basis for criticism, as being really among the things on which men live instead of mere luxuries and diversions. Among the neighbors who used to drop in at Vassar — to see the grown-ups, mainly, to be sure, but with kindly helpful greetings for the rising generation and with sometimes attentive scrutiny of individuals — were Dr. Lyman Abbott, our friend John Burroughs, Colonel T. W. Higginson, with his faith in ''Alice in Wonderland " as a text-book of wit and wisdom even as in later years, perhaps; and E. P. Roe, Mr. Mitchell, Mr. Swan, and Mr. Frederick Thompson, whose bodily presence would be more sorely missed if they had not built themselves into the college. The Sunday problem did not press theoretically or practically very closely upon the undergraduate, because the European Sunday had not then landed at Castle Garden. The Vassar Sunday of the seventies was reasonably free from complicating issues. Bishop Huntington, Phillips Brooks, Bishop Coxe, Dr. Abbott, the president of the college, were strong siding champions of the spirit. But from time to time a single day stood out with all the spiritual intensity later familiar in Walter Pater's description of White Nights. Such spiritual magic was wrought on a dull morning by a certain sermon that each one of the student hearers thought herself alone in her appreciation of, until at the conversational clearinghouse of the dinner table it appeared that there was a petition in circulation to ask for another sermon that day. The president of Smith College, L. Clark Seelye, had discovered to the students of Vassar an unsuspected capacity for more than one sermon on Sunday. To be sure he did not accede to their request, but in his fashion of declining, he deepened the impression he had already made, and laid the foundation of an almost romantic attachment between the two colleges which exists to this day. In the logic class, the next morning, his few questions and comments, called out by Dr. Backus, made amends by their scholarly urbanity for some of the hours of chilly abstraction that the lesson on the conversion of propositions had made necessary. Mark Hopkins, in a series of lectures to the senior and junior classes, made it possible for a few faithful girls on hard benches to know something of the fabled opportunities of the boy who shared a log with the great teacher. He lectured with absolute frankness. He laid open his mental processes and displayed all the machinery of his mind, quite unashamed, and unabashed, and unartificial. Other guests of the college came from over-seas, and as ocean travel was not the rapid transit it now is, they came and tarried, instead of being speeded on their way by automobiles. A ceremonious visit from Dom Pedro, of Brazil, changed the map of South America from a plan of the suburbs of the Amazon to a chart of the home-lot of a very kindly, cultivated, and able gentleman who was unfortunate enough to be an emperor temporarily. Charles Kingsley, Edward Freeman, and George MacDonald illustrated in different ways the unstable nervous equilibrium of genius or talent. Their appeal was sweetly persuasive, or brusquely challenging, or surprisingly irritating, but their assurance of never sinking back into the limbo of contemporary biography was complete as far as the memory of one generation of Vassar College students could last. They were all, in the phrase of the day, too real for words. The Vassar College of today is splendid. The undergraduate would say "simply splendid." But I am an old graduate, and I must make a distinction. The splendor about us on all sides is not simple, but complex. It is a fitting task for Miss Semple to explain in terms of anthropogeography why from geologic eras and from under the high arching sky over the Hudson River, Vassar was destined to be splendid. Miss Lathrop will tell you what the best of all educations is toward which these complex destinies are driving. I have tried to remind you of a very real and important distinction. Space in general is distinguished by the absence of things and the presence of forces. When things themselves are more significant by reason of their relation to force, place or time becomes spacious. The danger in human affairs is that the spacious will be confused with the empty and the idle; that force will be expressed in confusion or machinery. The Vassar of the future must accept the task of solving her growing problem in a spirit loyal to the beginnings made in one of the perfect moments of our republic — the years we call "the seventies. " Dr. Stephen Grant has supplied a biographical note on Mary Augusta Jordan. Dr. Grant has also written for the Vassar encyclopedia on Ms. Jordan's sister, Emily Jordan Folger.